Coming up with amazing window blind ideas doesn’t have to be a nerve wracking process. Take a quick peek at some of the best ideas that will help accentuate your living room decor. Have you spent years looking at the same old blinds? If you’re ready for a change, there are plenty of options out there. New blinds can really give your living room a face lift. They’re a great, inexpensive way to give the room a whole new look. And why shouldn’t you give your living room some TLC? Chances are, this is the room your visitors see most often, so add a special touch! But what kinds of blinds are there? Are there really options that aren’t boring and plain? There absolutely are blinds that aren’t boring and plain! Keep reading and we’ll tell you about eight great window blind ideas. If you’re looking to show off your living room, this is the list for you. Wooden blinds are a fun alternative to traditional white slat blinds. If you have wooden furniture, match the style and color to bring the whole room together. Wooden blinds are nice and sturdy, and beautiful too. You’ll have plenty of finishes and stains to choose from. You can also choose your slat size. For an elegant look, pair your wooden blinds with drapes or a window blind valance. Tired of slats? Try some roller blinds on for size. These blinds don’t only eliminate the annoying sun lines that come from slat blinds. They also look great while doing it! When you don’t want your blinds pulled down, just roll them up. Sleek and tidy, they’ll look great even when shut. Do you like to shake things up? Change the look of your blinds whenever you want by switching fabrics! With many colors to choose from, you’re sure to find the perfect match for your living room. Faux wood blinds are just like wooden blinds, but not! You’ll get the same great look, but with some added benefits. Faux wood is less expensive than real wood, so you’ll save yourself some cash with this option. They’re easy to clean, and they won’t warp or fade! If you like the look of wooden blinds but are worried about moisture, go with faux wood! Roman shades are great for adding character to a room. If you go with this option, you’ll have tons of designs to choose from. Find your favorite color, or discover the perfect design to compliment your furniture. Compare textures and see which one you like best. Roman shades help you block out the sun, provide privacy, and make your living room look great. These shades will especially stand out in a room that’s all or mostly done up in white. Yes, these are often associated with nurseries. But that doesn’t mean you can’t use them in your living room? Do you live in an area with tons of sunlight? Is the sun always right in your eyes when you read from your favorite spot in the evening? Blackout shades or blinds are great for completely blocking light from coming into a room. You may especially appreciate these blinds if you like to watch television in your living room. You can control the amount of light in your living room without making it dark! If blackout shades aren’t your thing, maybe light filtering blinds are. Light filtering blinds allow you to block direct sunlight while still allowing it to light up a room. These are great for living spaces, especially if you have a lot of light to block, or you want to eliminate glare. If you really want your windows to stand out, consider getting woven wood shades. These shades bring a certain style that other shades don’t. A definite conversation starter, they’ll enhance your living room as soon as you install them. Just make sure you pull them down before you start munching on your movie night popcorn! If not, you may leave grease spots. If you’re looking for stylish shades that are also energy efficient, these are the shades for you! These shades feature fabric in honeycomb-shaped cells. This unique layering system provides insulation. Blocking the sun from your eyes is one thing, but doing it while saving on energy bills? We call that perfection. If you live in areas with extreme heat or cold, you’ll appreciate the insulating abilities of these shades. Instead of spending big bucks on heating and cooling, you’ll have that cash for something else. While these shades are super practical, you don’t have to give up style. They’ll look great in any living room, so give them a try! There are so many fun window blind ideas. With just a little research, you’re sure to find the perfect fit for your living room. Are you looking to block out all light for the perfect movie-watching atmosphere? Or do you simply want to keep the light from your eyes when you’re lounging? Maybe you want a statement piece to grab attention right when visitors enter the room. 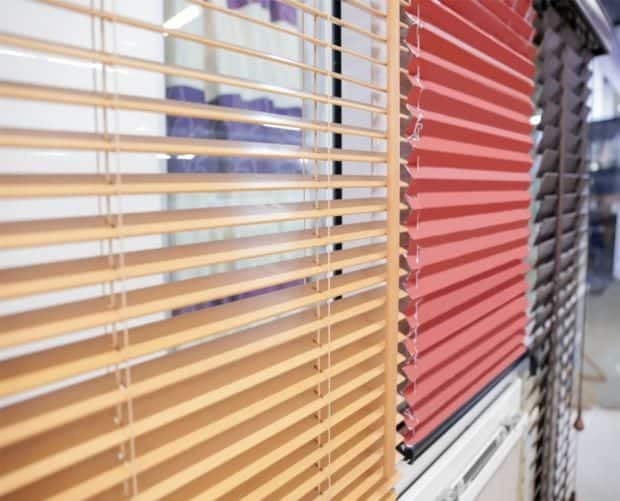 Whatever your reasons, there are many window blind ideas just waiting to be explored. Research your many options, and then narrow it down to the ones you love. Once you find something perfect, add it to your living room. You’ll love your new setup, and your visitors likely will too! We’d love to help you find the perfect blinds for your living room. Contact us today to book a free expert consultation!